ROME (AP) Gennaro Gattuso’s debut as AC Milan coach ended in nightmarish fashion when goalkeeper Alberto Brignoli equalized in the fifth minute of stoppage time to earn Benevento its first ever point in the top division with an improbable 2-2 draw Sunday. In an up-and-down day for the Milan clubs, Ivan Perisic scored a hat trick as Inter took the Serie A lead with a convincing 5-0 rout of Chievo Verona at the San Siro. Earlier, 10-man Milan was protecting a lead when Brignoli came forward for the final play of the match and scored with a long, leaping header following a free kick. Benevento had lost all 14 of its matches for the worst start to a season in modern history among Europe’s five major leagues. If Benevento had lost again, the southern club would have matched Brescia in 1994-95 for the longest losing streak in Italian league history. Milan opened strongly and Giacomo Bonaventura scored one goal – his first since January – and set up another for Nikola Kalinic after George Puscas’ temporary equalizer for Benevento. Milan dropped to eighth place. Inter extended its unbeaten record to 12 wins and three draws and moved one point ahead of Napoli, which lost to Juventus on Friday. Six-time defending champion Juventus is third, two points behind Inter. 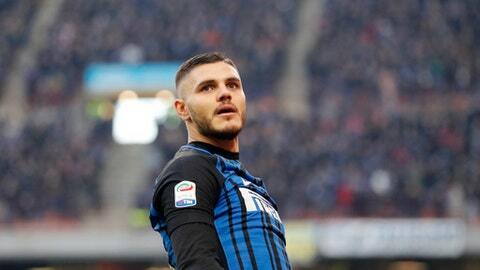 In addition to Perisic’s goals, Icardi scored his league-best 16th in 15 matches and Milan Skriniar also found the target. After struggling through four managerial changes last season and finishing seventh to miss out on European competition, Inter has improved vastly under former Roma coach Luciano Spalletti. However, the Nerazzurri should be tested next weekend when they visit Juventus. Fiorentina moved ahead of Milan into seventh with a 3-0 win over visiting Sassuolo. Giovanni Simeone, Jordan Veretout and Federico Chiesa scored for the Viola. Also, Mattia Destro scored a late equalizer for Bologna to cancel out Joao Pedro’s opener in a 1-1 draw with Cagliari.